Venzi Takev brings the great aura of the Balkan Gypsy Diva to the band, in other words the Grand Signore and the elder showman of the quintet. If you see him you have the imagination to be in a Kusturica Film. But put away the stereotypes! Behind the attractive picture you will find moreover the fantastic violin virtuoso. He is one of the great music figures of the Balkan that can play his instrument with precision, genuineness, smartness and style. Venzi looks back to a long music career. Since more than 50 years he is on stage. He is popular musician in Bulgaria thanks to its endless live gigs that range from gigs on strange open air stages like on the trailer of a tractor to the biggest halls and tv shows. He was in studio and on stage with the biggest Bulgarian music stars. Nikolai Ivanov is a multi instrumentalist, composer and artist. Beside this he brings in Balkan Khans the rich experience of a cultural nomad that trailed through various geographical and creative areas. Born in 1959 he started to play piano at the age of 5, at 7 violine and at 13 guitar. In 1978 he graduated the Fine Arts Secondary School and in 1986 the Academy of Arts, both in Sofia. In 1991 Nikolai Ivanov set up OM Art Formation – the first ethno ambient group in Bulgaria, and began intensive concert and recording activities. He played many times in Europe and Asia (India, Nepal, and China). 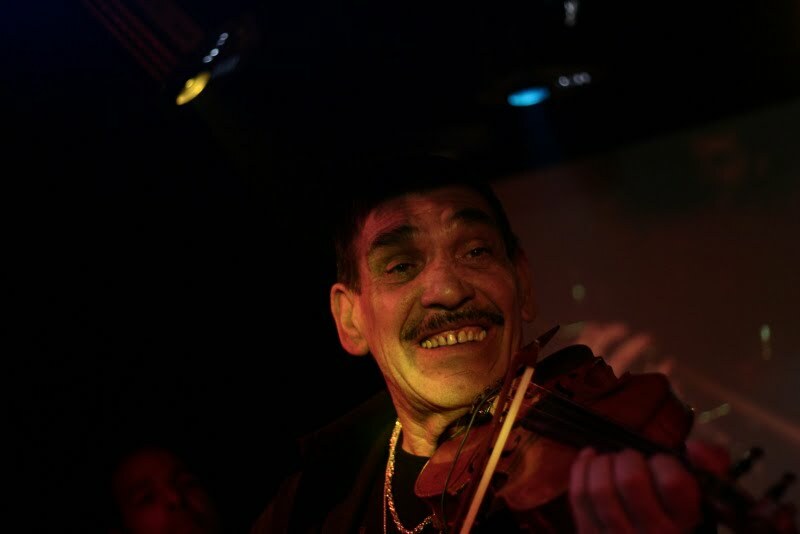 In 1996 Nikolai Ivanov was one of the initiators and participants of the Everest Concert Expedition which performed the “Highest” concert in the World (5345 m above the sea level at Kalapatar, under Everest).He participated in several international projects together with musicians from all over the world. He made music for 30 films and documentaries, several of which awarded with prestigious awards in Europe, the USA, Canada, Asia and Africa. Furthermore, he made the music for two ballets and some theatre performances. Nikolai Ivanov plays the Bulgarian tambura, acoustic guitars, sitar, piano, synthesizers, flutes and percussion instruments. He also sings in the mode of different traditions of Indian and Balkan music. In his various projects he mixes tradition and modernity, different genres and expressive languages. He makes music experiments ranging from jazz and vanguard to electronic styles, psychedelic, film and ambient music. Next to his music career he is a painter and makes installations and performances. However, in the last 20 years OM ART FORMATION has remained his main band in which his expressive language became real that ranges from mystical flavor, jazz improvisations and composition creativity. Discography: Nikolai Ivanov recorded music with the labels of ERDENKLANG; TUA; OZELA( GERMANY), RFI, SUNSET (sampler) MK2 (sampler)-(FRANCE) PERIFERIC REC. (Hungary) and DS Music, AveNEW, Vitality (Bulgaria) He is Bulgarian participant in the world sampler –“Musique ECinema du Monde” –MK2 FRANCE. Where other bands uses drum machine, backing tracks or a set of sampler, Balkan Khans has Skiller. 7 minutes jungle or drum and bass rhythm, no problem – Skillers mouth do it! Dirty House beat or the sounds of snares, clicks and cuts, no problem – Skillers mouth do it! Basses and strange kind of samples, no problem – Skillers mouth do it! Furthermore the live sets of Balkan Han can be spiced by his solo beatbox sketches. 22 year old beatboxer Skiller aka Alexander Deyanov from Sofia/Bulgaria is better known as the “fast mouth” from the East. He earned this title thanks to its ability to perform fast rhythms and drum patters. Alexander takes his beatboxing beyond the traditional hip hop influences into a much broader range of contemporary styles. The ability to express himself trough a different way gives him the opportunity to explore the art with different projects and makes him attractive for one of the most successful companies in the country – Nestle Bulgaria. 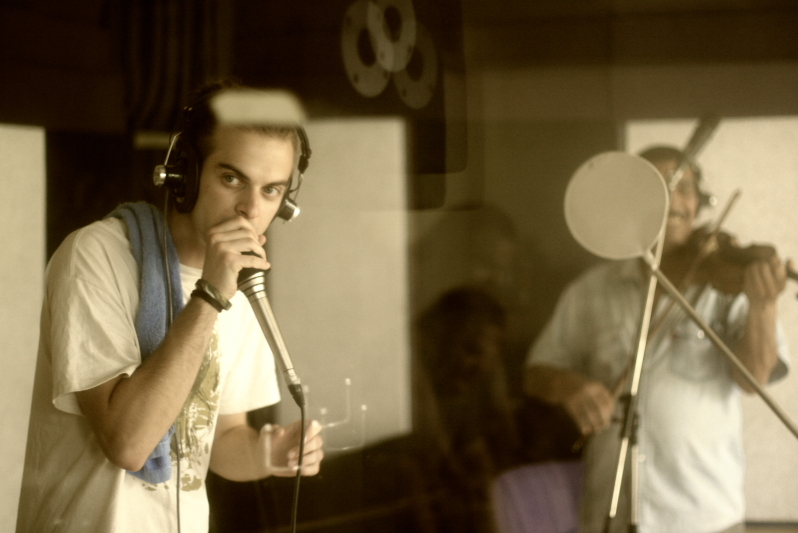 Skiller has brought the art of beatboxing to mass attention in Bulgaria. He is the first national beatbox champion (2007). Despite his age he has been on stage in countries like: Japan, England, Germany, Russia, Italy, Austria, Switzerland, Czech Republic, Romania, Serbia, Slovakia, Greece and many others. He sheared the stage with various international artist like: Shaggy, Lumidee, Outlandish, Jaba, N.O.H.A, Stereo MCs, Transglobal Underground, Foreign Beggars, and many others. 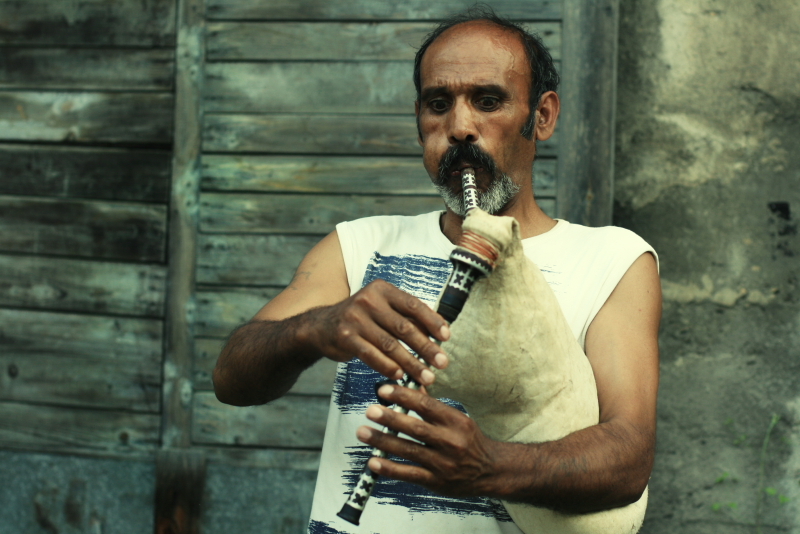 Kolio is one of these extraordinary talented gypsy musicians coming from the tiny town Straldzha. He is an autodidact who brings the purity of street and folk music into the band. He plays the bag pipe as one of his instruments in Balkan Han. It might be known only to insiders but this instrument is a really popular instrument in the Balkan music. The bag pipe can carry the deepness and mystic out of Balkan melodies and tunes. Beside of this Kolio plays the Tapan or belly drum. The Tapan is definitely one of the most impressive rhythm instruments of the world. Kolio will catch you dancing when beat the drum as part of Balkan Khans. Beside this Kolio is master the art of carving. So he cut by his own wooden instruments and bag pipes. If you are interested just contact us. Joining the band in 2014, it is time for Atesh to bring some more oriental spice to the band. He played long years in well known bands from Bulgaria. At first to mention Ivo Papassov Wedding Band. 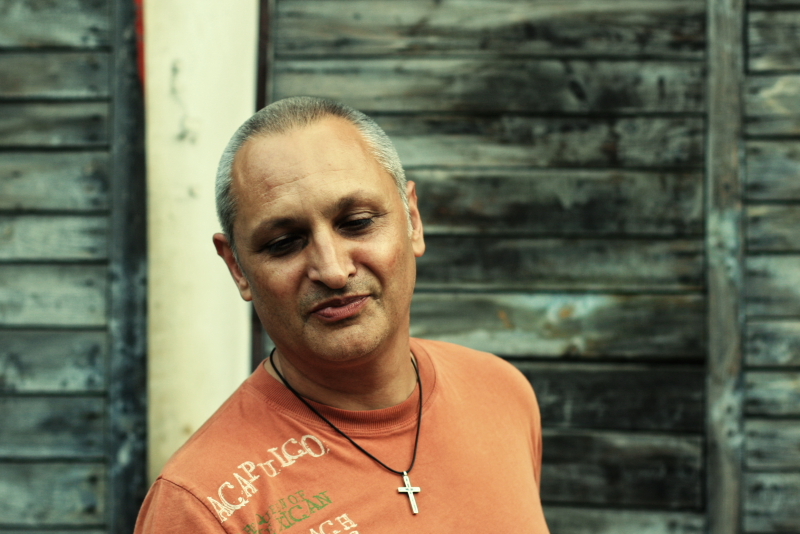 Atesh is well known for his funky but solemn groovy style of play. Mitko Uzunov is a member of the orchestra at the National Bulgarian Opera playing one of the most powerful brass instruments. For the first international tour of Balkan Khans Mitko just interrupted the rehearsals for the Rheingold Opera in which he played in Sofia. 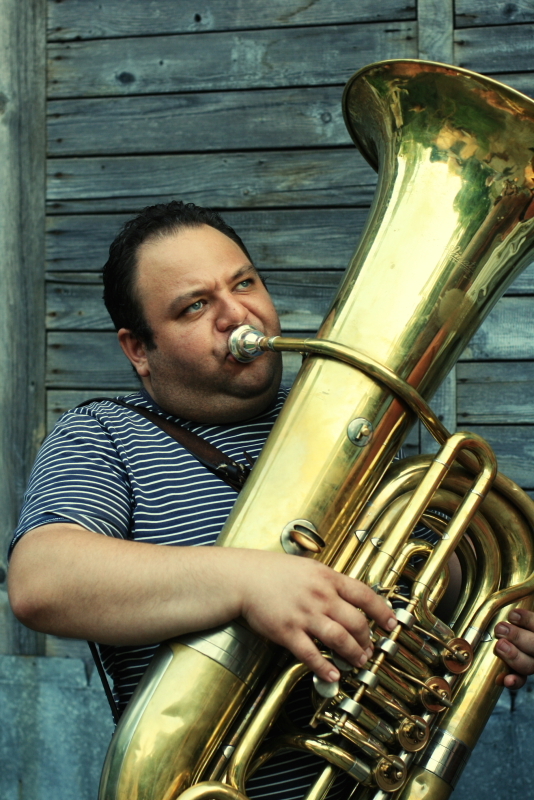 As classical musician he is not simply playing the tuba as an auxiliary hookline instrument in the band. Overall he will impress you by playing deep deep melodies.